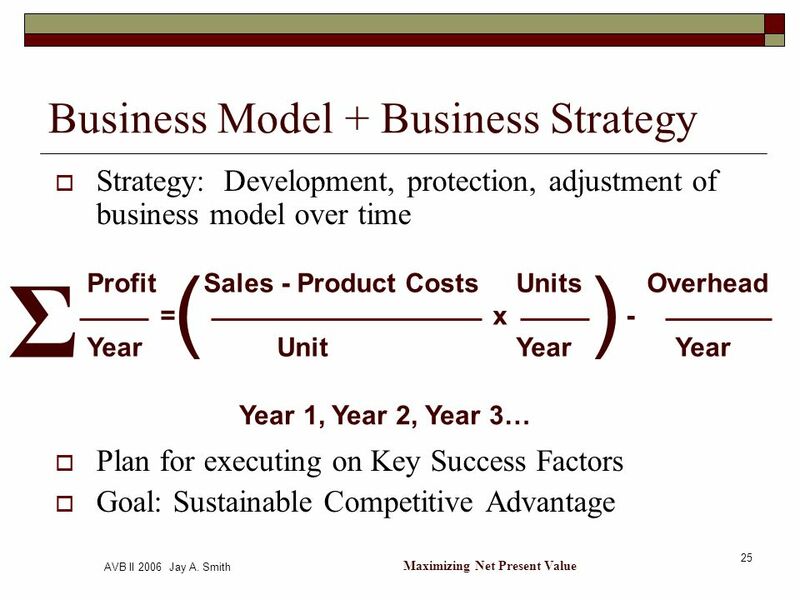 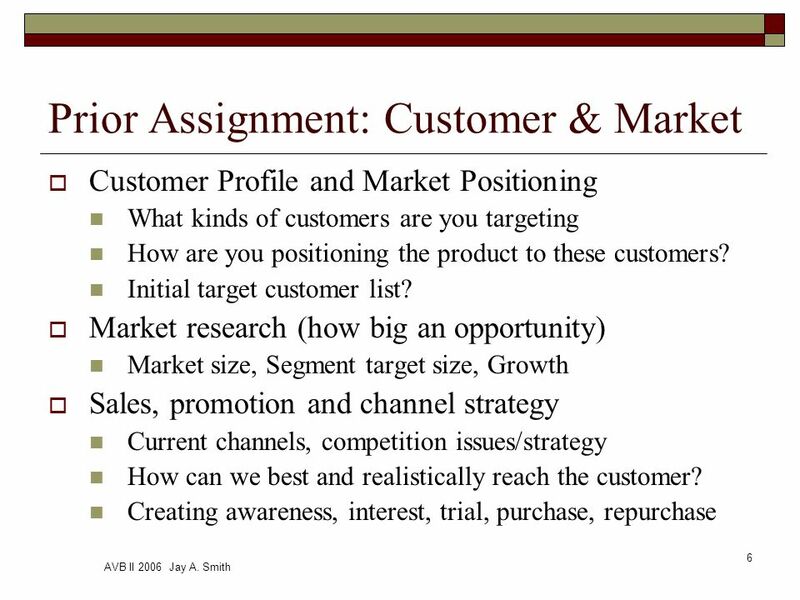 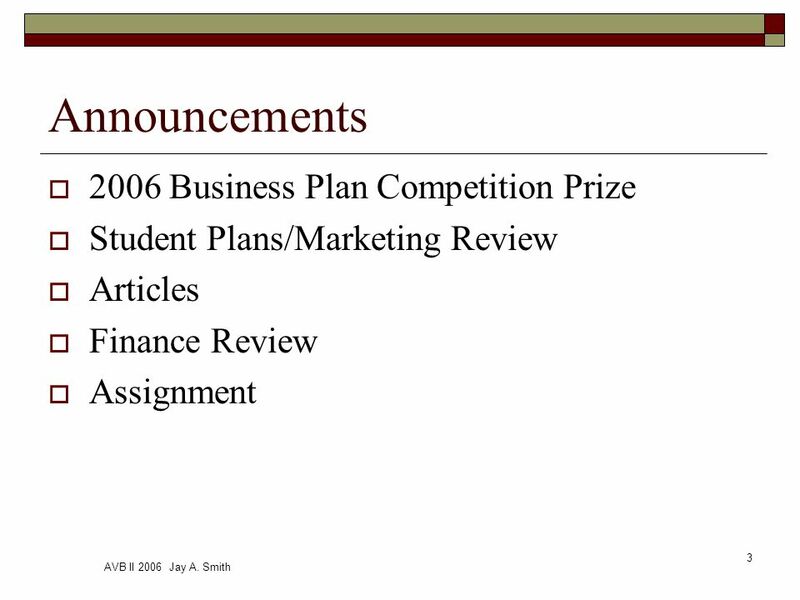 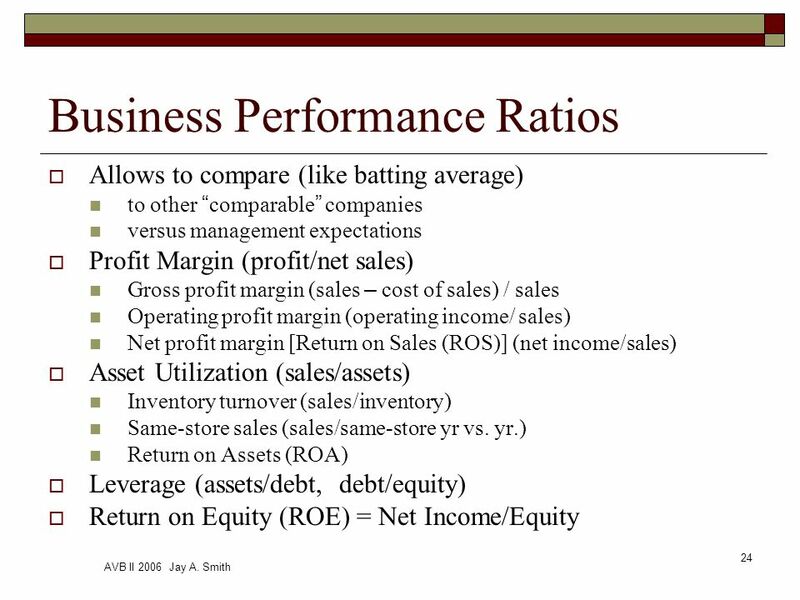 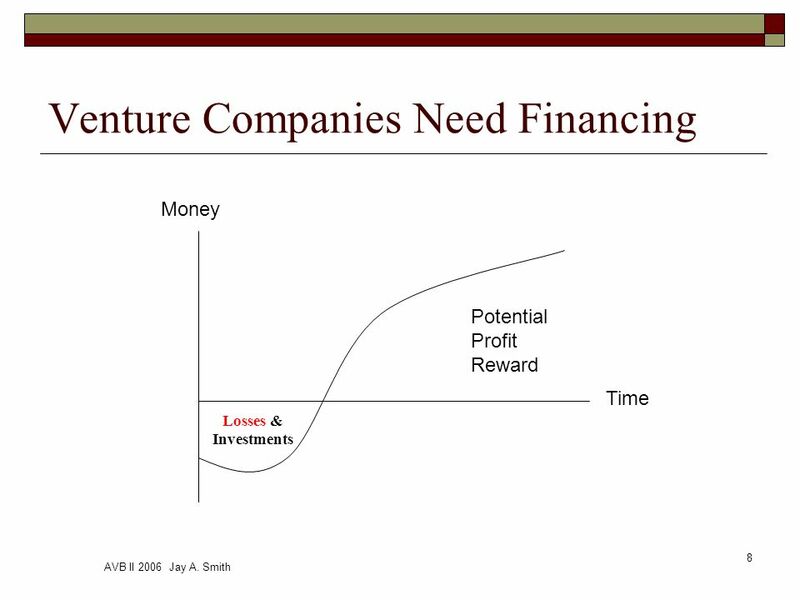 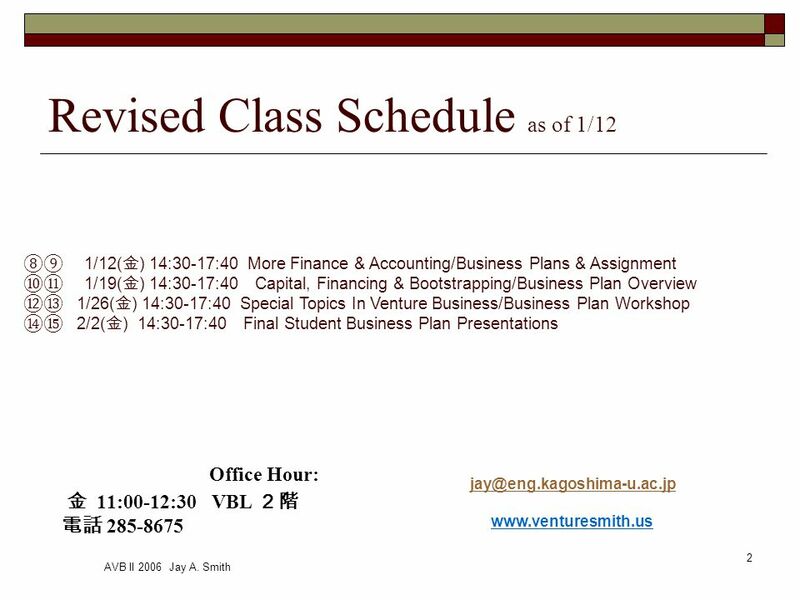 AVB II 2006 Jay A. Smith 1 Classes 8-9 Project Review & Finance for Venture Business. 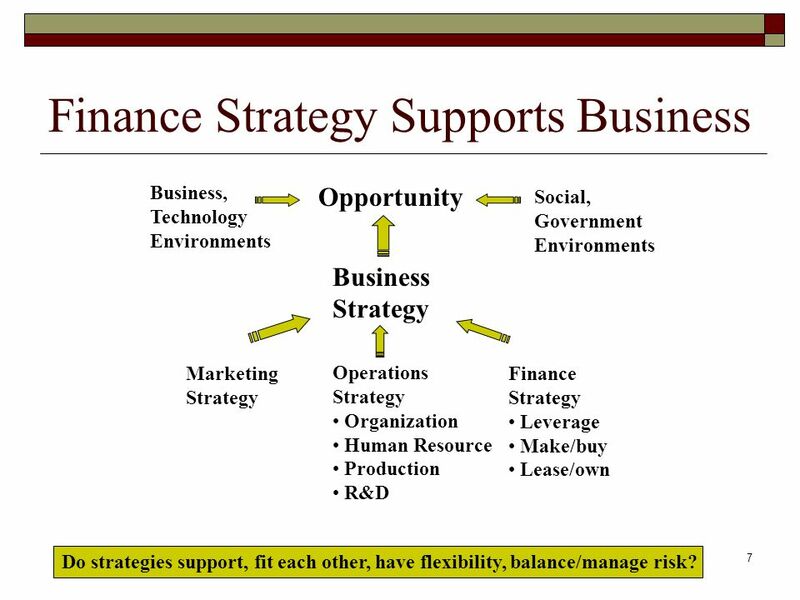 7 AVB II 2006 Jay A. Smith 7 Finance Strategy Supports Business Business, Technology Environments Opportunity Social, Government Environments Business Strategy Marketing Strategy Operations Strategy Organization Human Resource Production R&D Finance Strategy Leverage Make/buy Lease/own Do strategies support, fit each other, have flexibility, balance/manage risk? 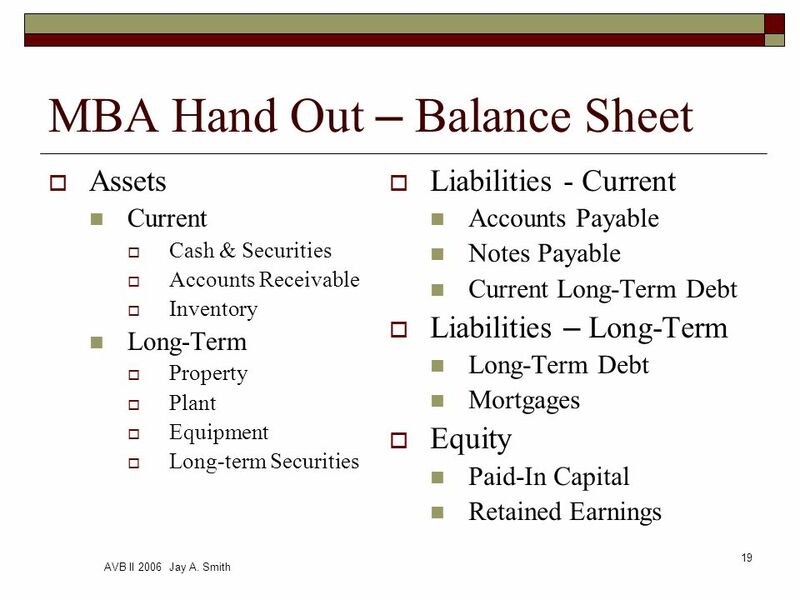 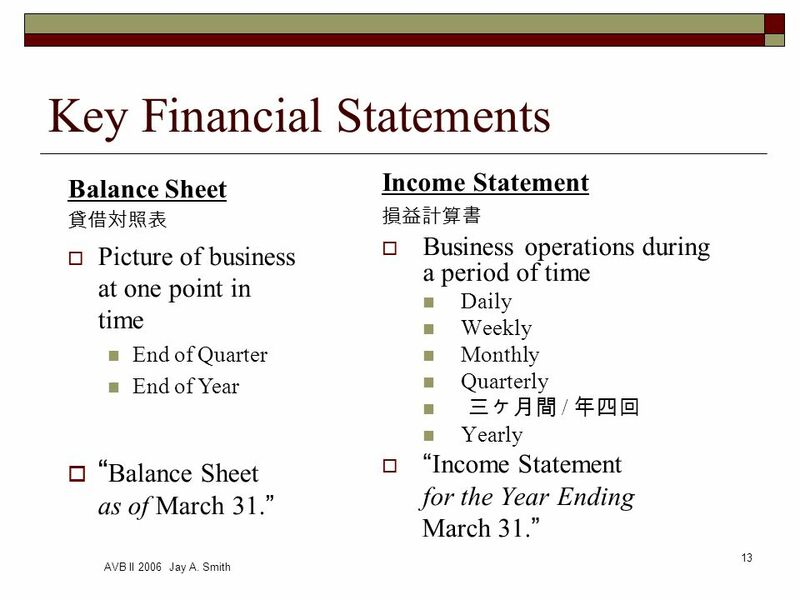 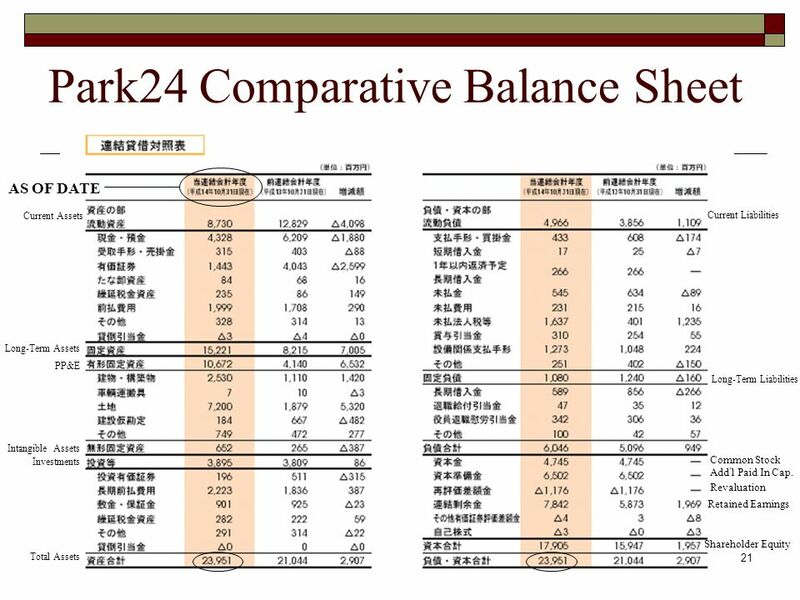 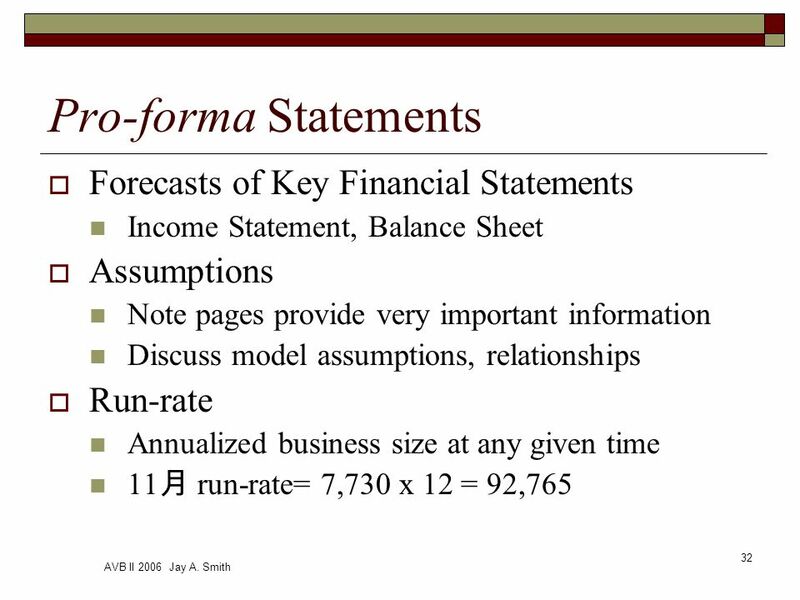 13 AVB II 2006 Jay A. Smith 13 Key Financial Statements Balance Sheet Picture of business at one point in time End of Quarter End of Year Balance Sheet as of March 31. 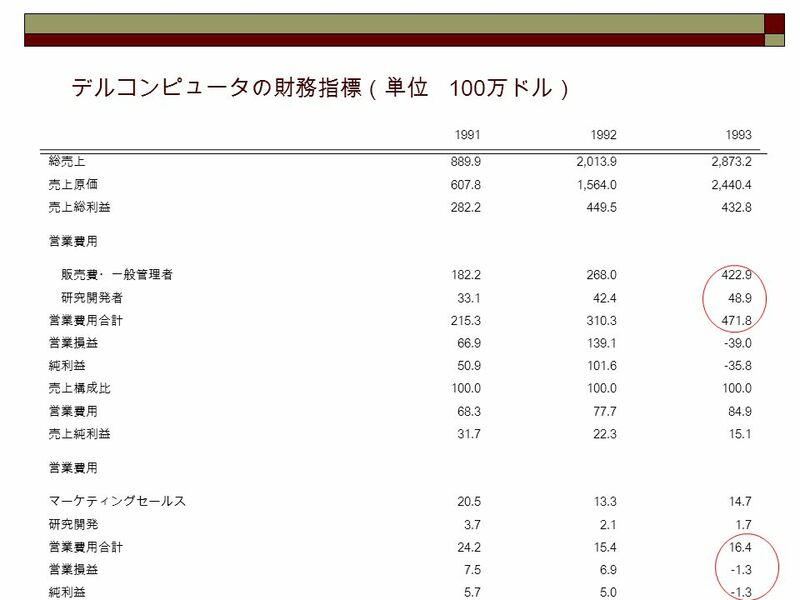 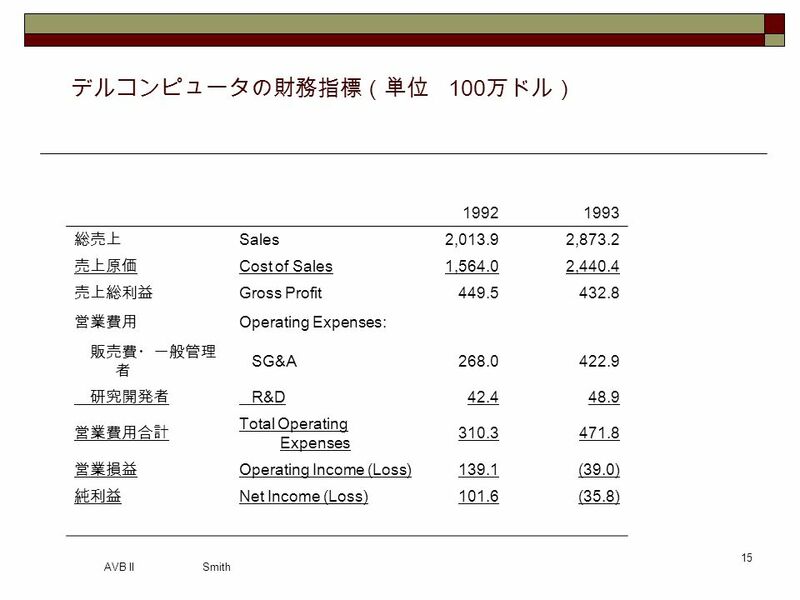 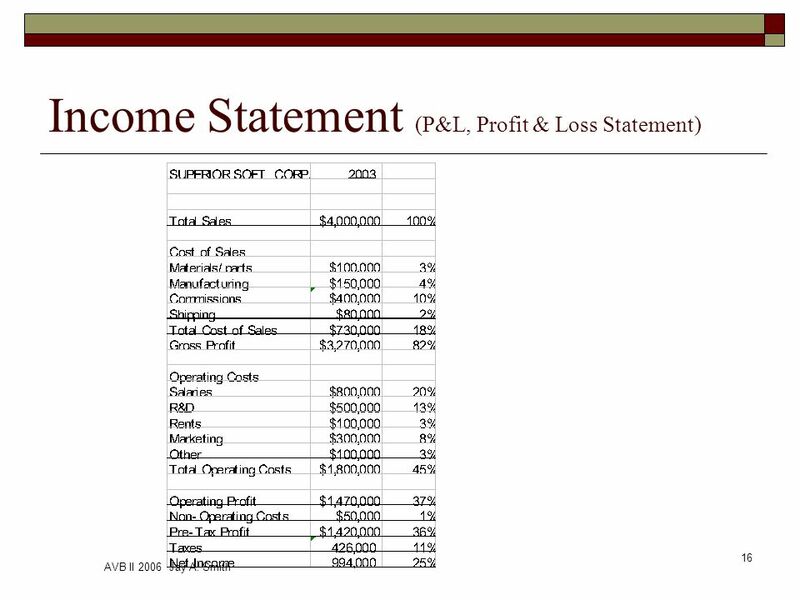 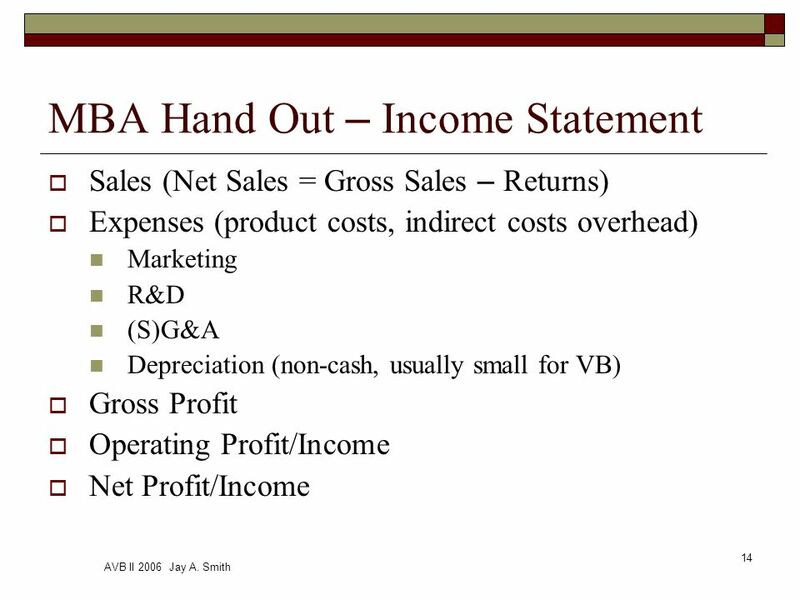 Income Statement Business operations during a period of time Daily Weekly Monthly Quarterly / Yearly Income Statement for the Year Ending March 31. 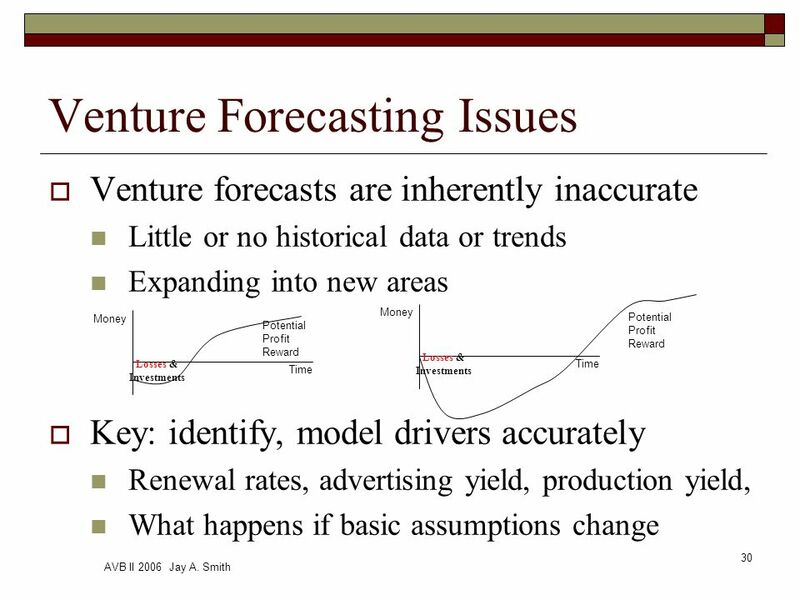 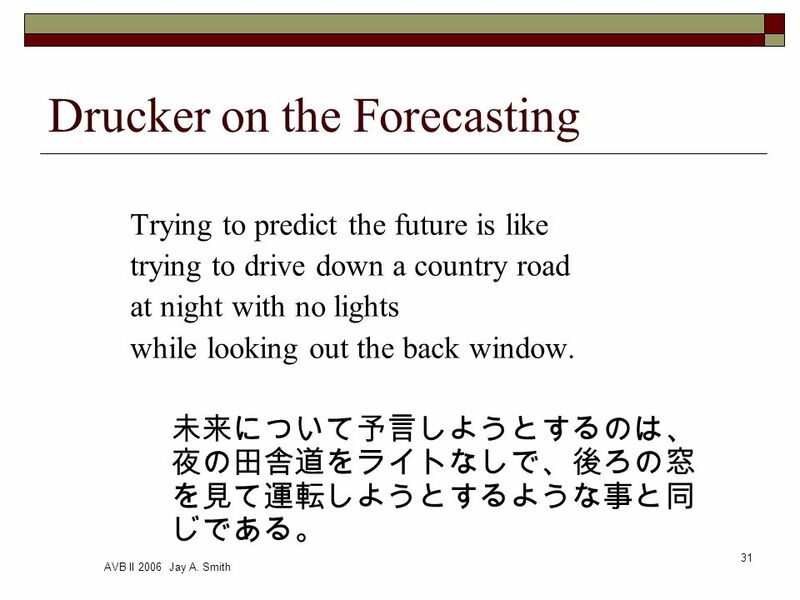 31 AVB II 2006 Jay A. Smith 31 Drucker on the Forecasting Trying to predict the future is like trying to drive down a country road at night with no lights while looking out the back window. 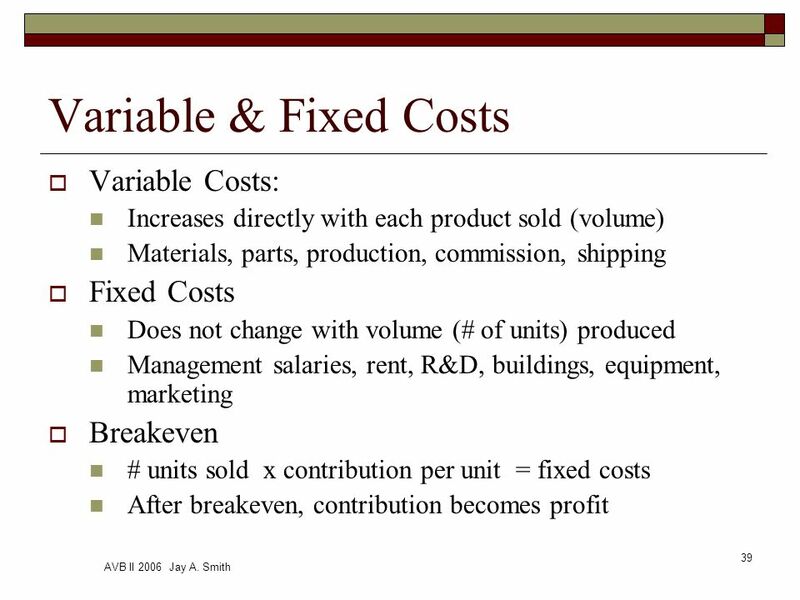 35 AVB II 2006 Jay A. Smith 35 Price Issues What does it cost to produce? 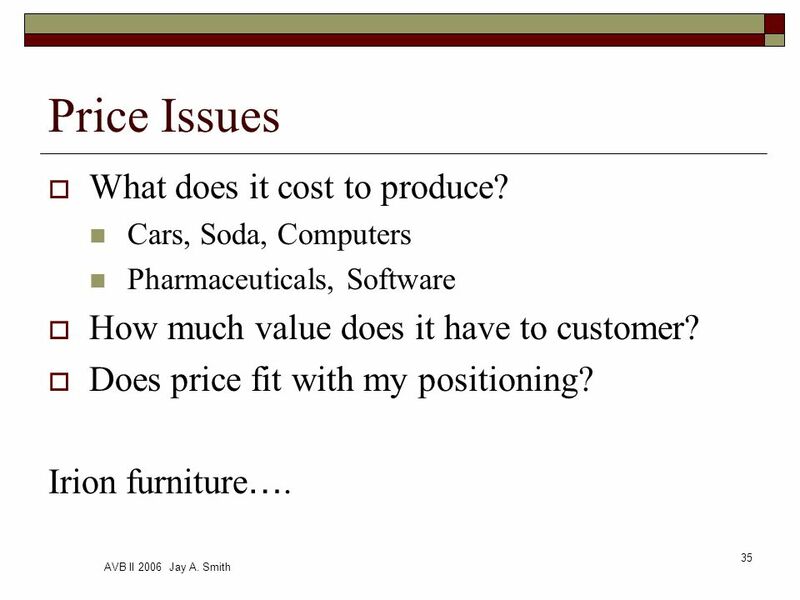 Cars, Soda, Computers Pharmaceuticals, Software How much value does it have to customer? 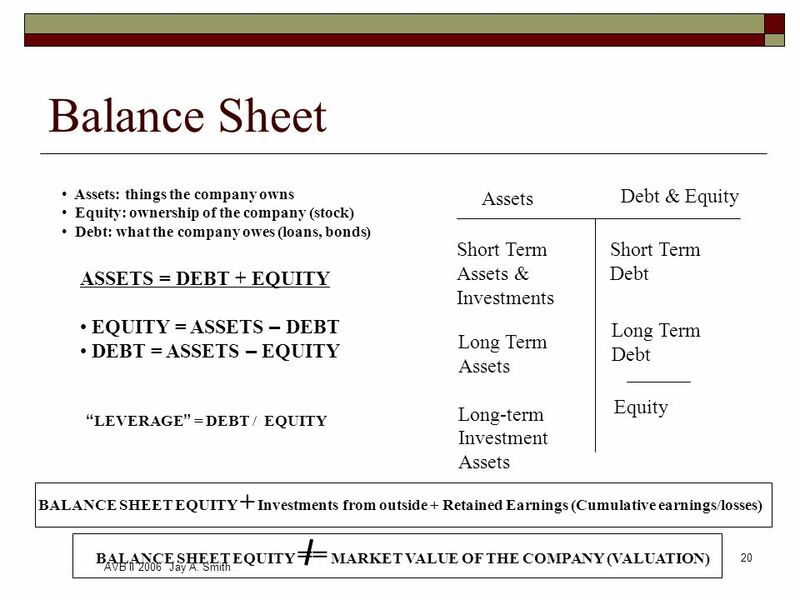 Does price fit with my positioning? 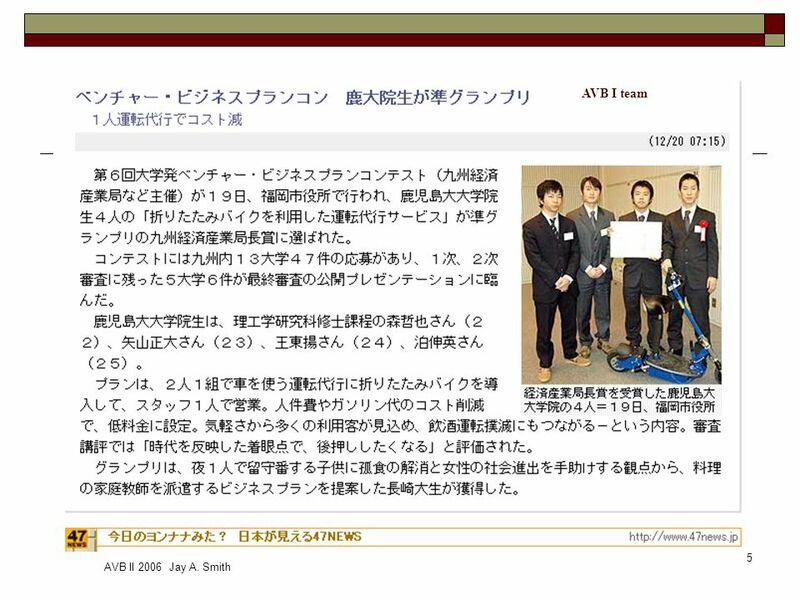 Irion furniture …. 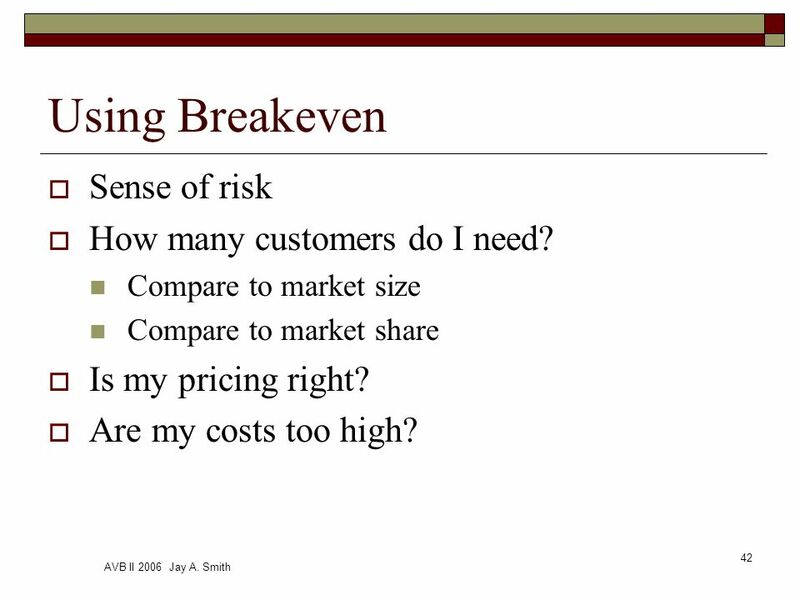 42 AVB II 2006 Jay A. Smith 42 Using Breakeven Sense of risk How many customers do I need? 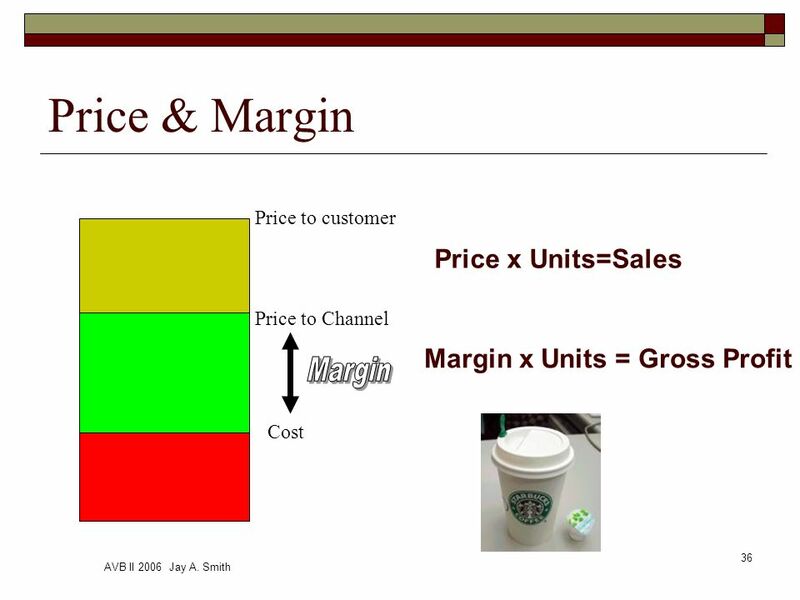 Compare to market size Compare to market share Is my pricing right? 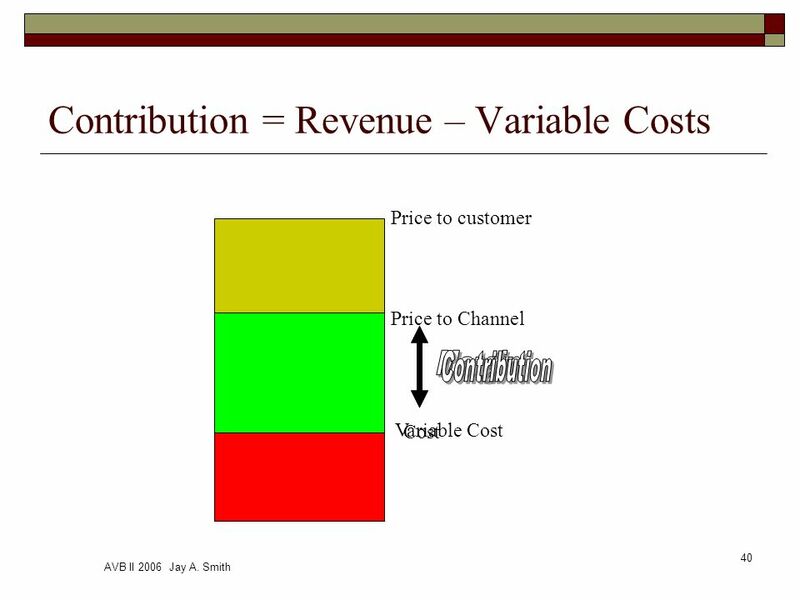 Are my costs too high? 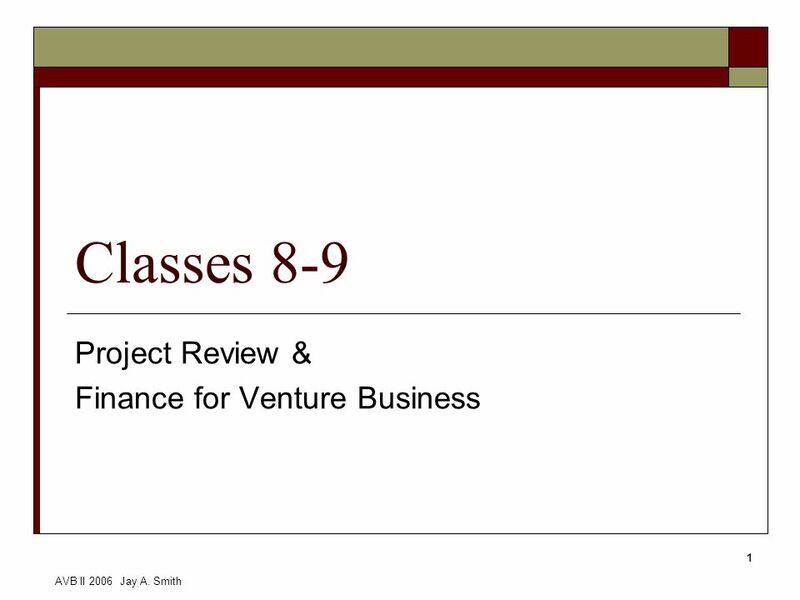 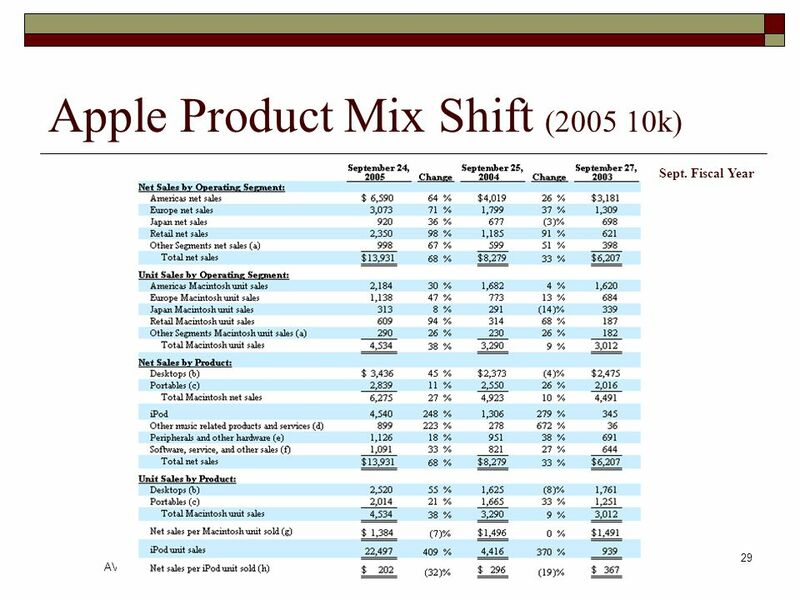 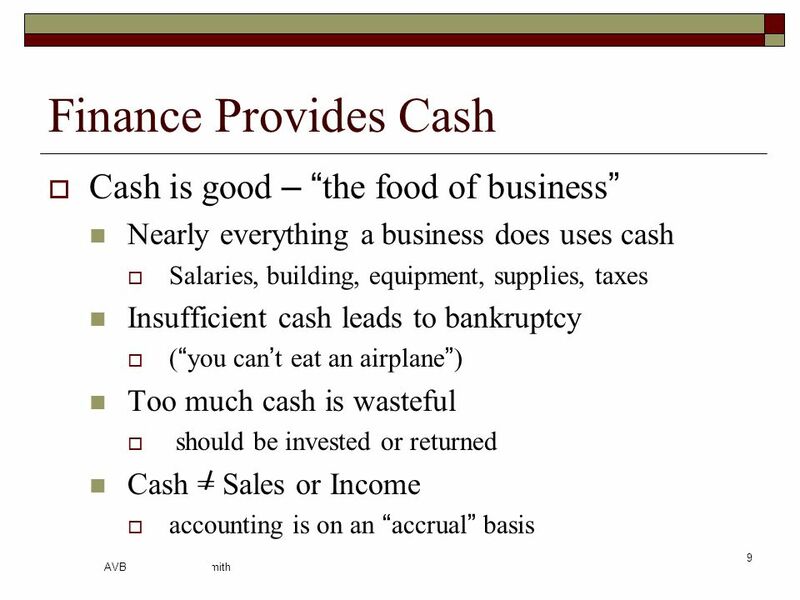 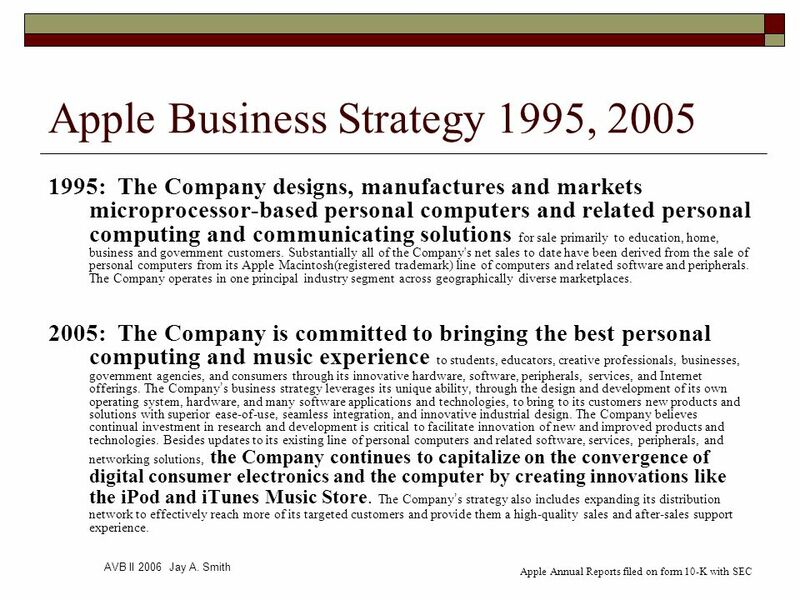 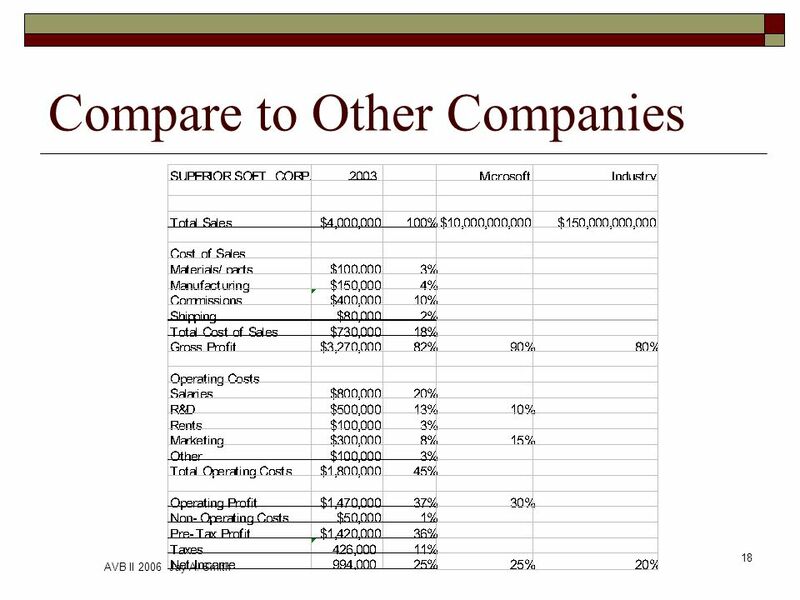 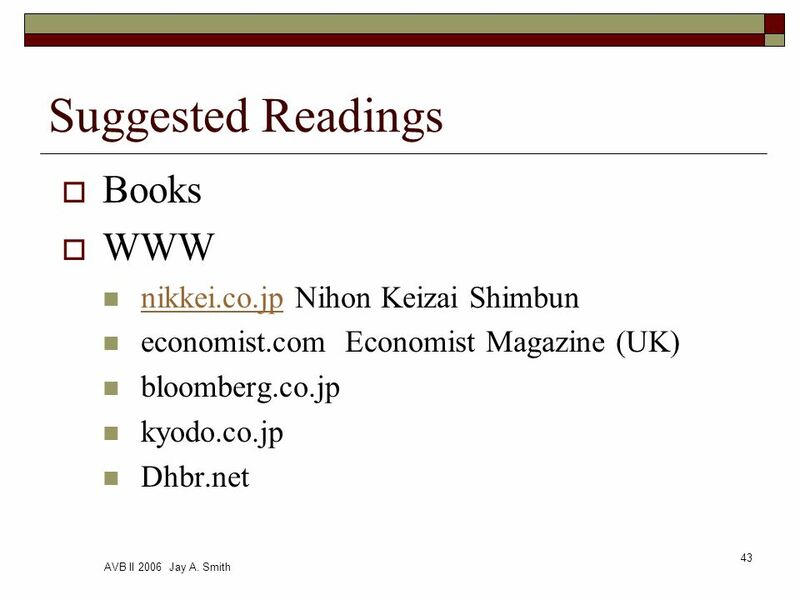 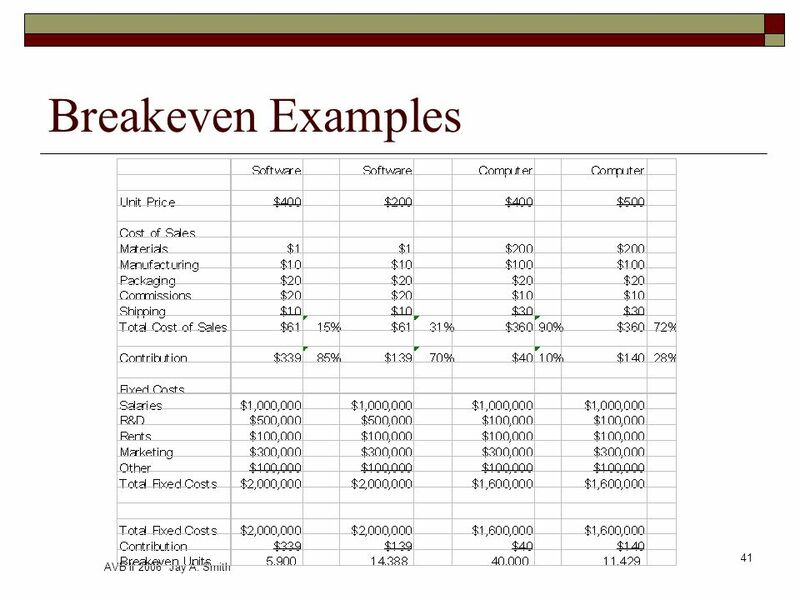 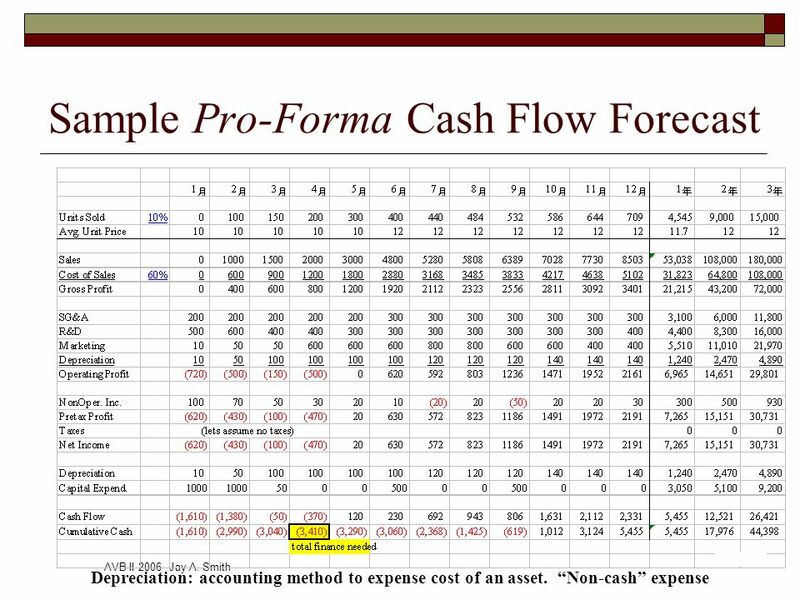 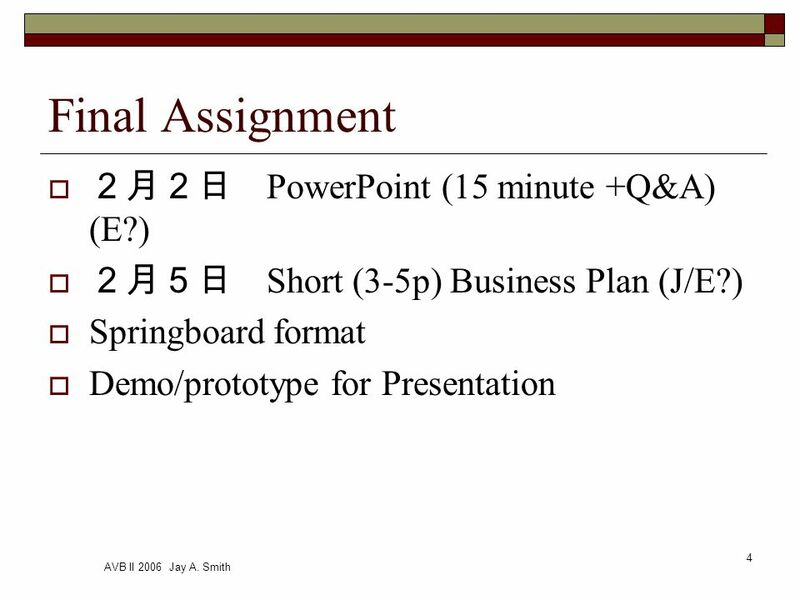 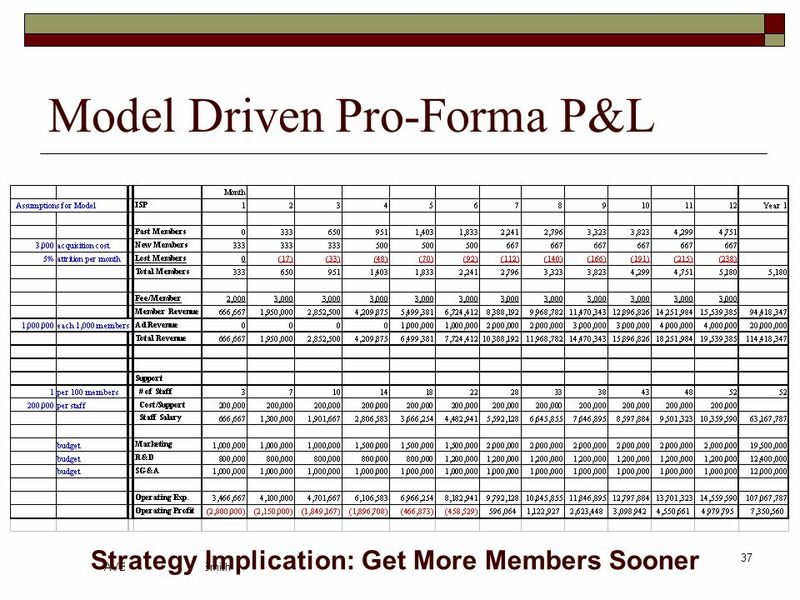 Download ppt "AVB II 2006 Jay A. Smith 1 Classes 8-9 Project Review & Finance for Venture Business." 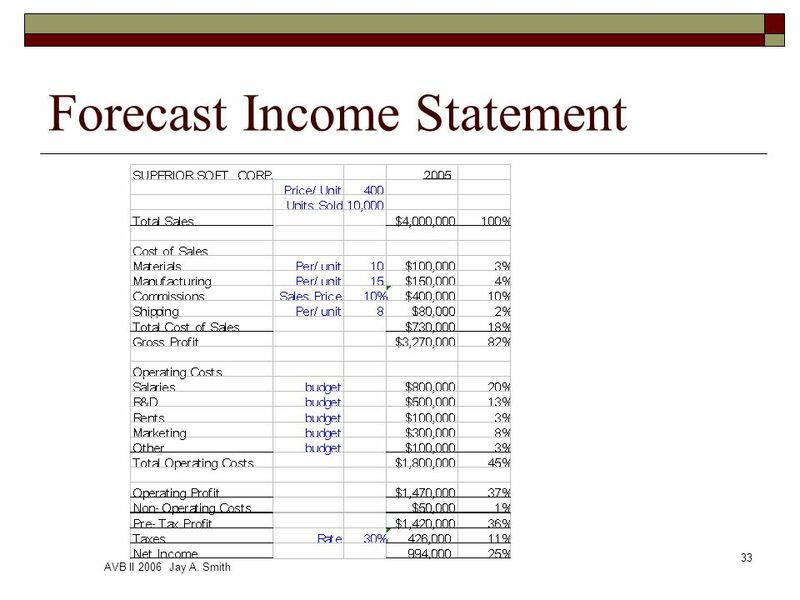 Financial Analysis for Union Researchers Adapted from: Tom Juravich UMASS Amherst Labor Center. 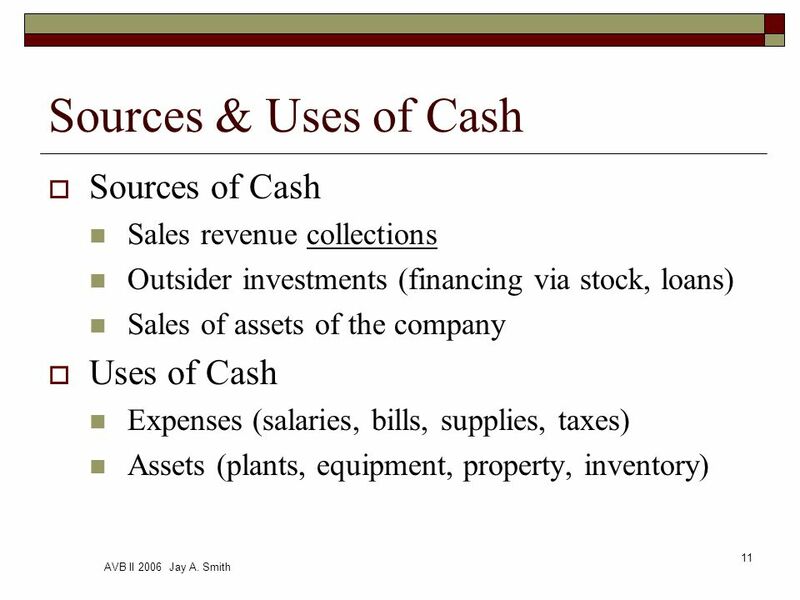 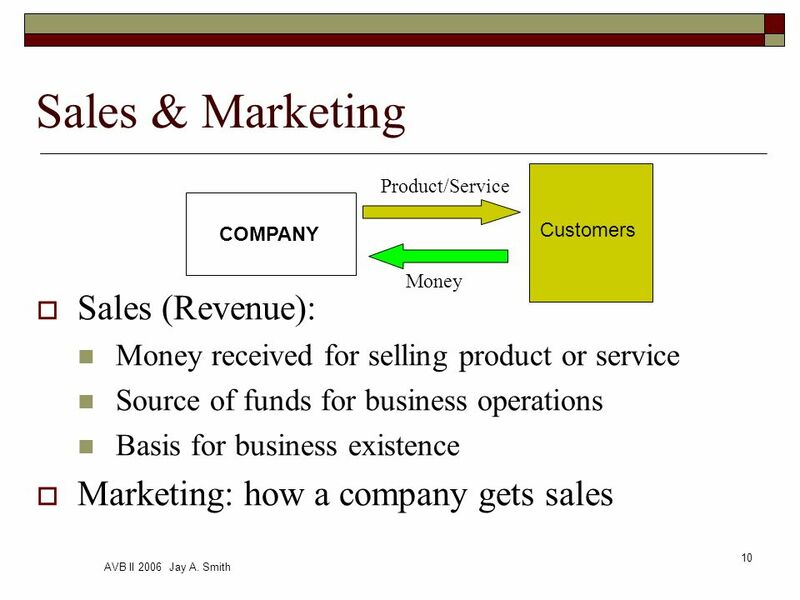 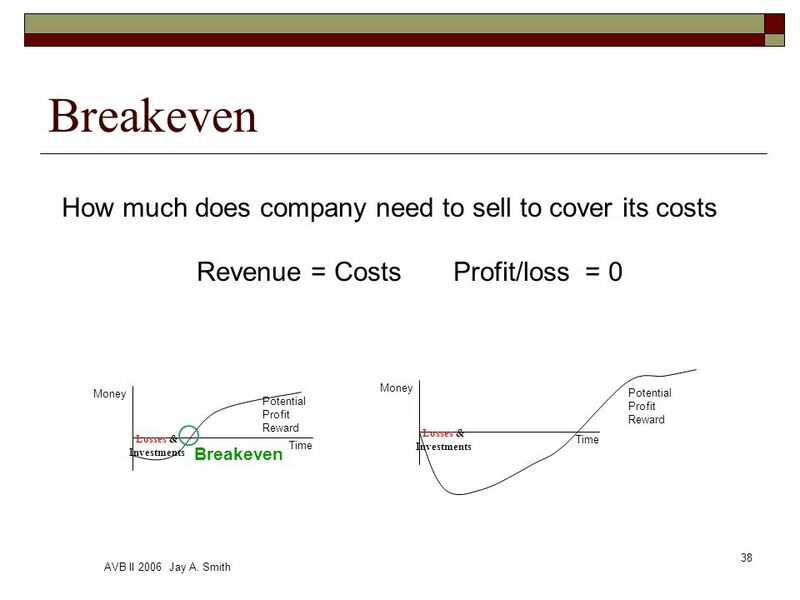 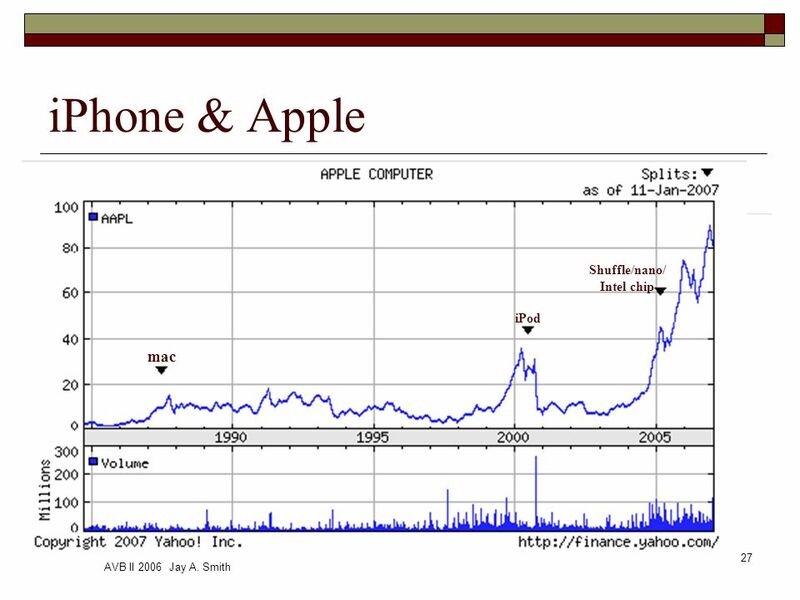 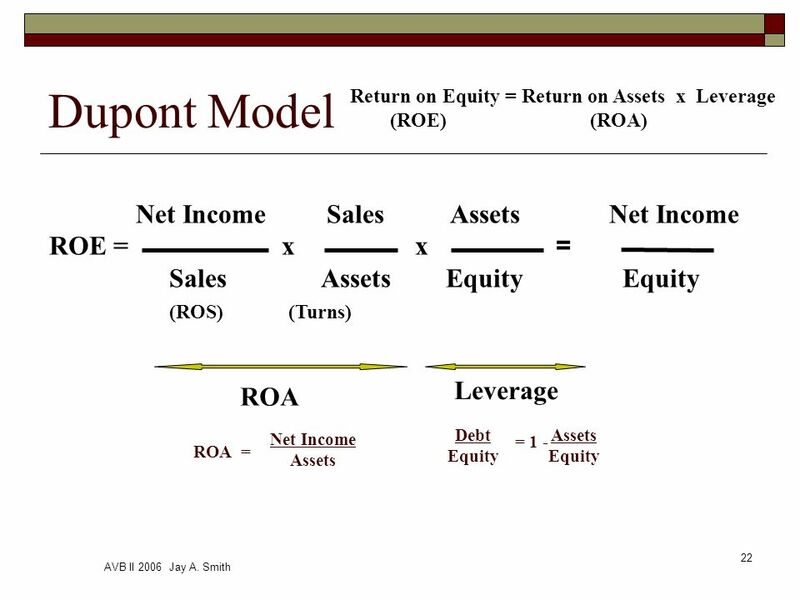 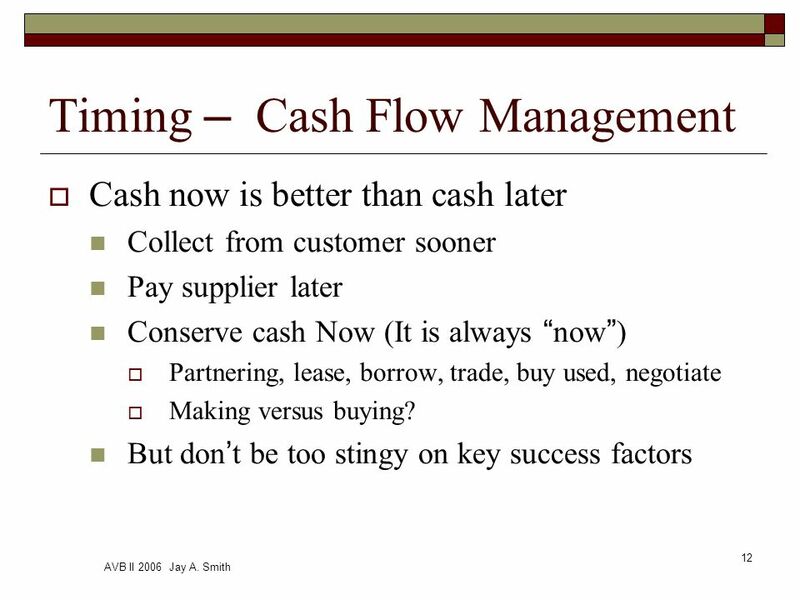 AVB II 2006 Jay A. Smith 1 Classes Venture Business Finance (continued) Raising Capital and Bootstrapping.